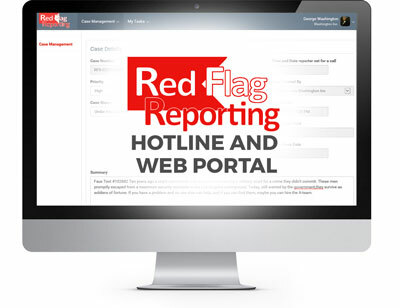 Red Flag Reporting (“RFR”), subject to an agreement with its clients, offers services to obtain information from employees and others regarding illegal, unethical and unsafe activity. The information obtained by RFR is then provided to its client’s authorized representative without evaluation or alteration by RFR. RFR provides no assurances on the accuracy or reliability of information gathered. RFR does not investigate matters reported to it and is not responsible for resolving them. The client of RFR, for which the report relates to, is responsible for report investigation and resolution and is also responsible for complying with all laws related to the investigation and protection of such information. The client is also responsible for the protection of all rights of all persons accused of any offense. Please be aware that intentionally submitting false or misleading information may lead to civil and/or criminal prosecution. Remain anonymous and not communicate with management. To remain anonymous, do not provide any personal identifying information, including on any documents you upload into your report. Please be aware that even if you choose anonymity, facts gathered during an analysis of your concern(s) may point to your identity. Maintaining the security of your data is important to us. RFR takes technological, procedural, contractual, and physical security measures to safeguard your data. For protection, all data on our platform is submitted over a secure socket layer encrypted connection. You expressly understand and agree that under no circumstances shall RFR or its affiliated companies be liable to you or any user because of use or misuse of this service. Such limitation of liability shall apply to prevent recovery of direct, indirect, incidental, consequential, special, exemplary, and punitive damages. Such limitation of liability shall apply whether the damages arise from use or misuse of and reliance on the service, from inability to use the service, or from the interruption, suspension, or termination of the service. Under no circumstances shall RFR or its affiliated companies be held liable for any delay or failure in performance resulting from any circumstances, including but not limited to acts of nature, forces, or causes beyond its reasonable control, including, without limitation, internet failures, computer equipment failures, telecommunication equipment failures, other equipment failures, electrical power failures, strikes, labor disputes, riots, insurrections, civil disturbances, shortages of labor or materials, fires, floods, storms, explosions, acts of god, war, governmental actions, orders of domestic or foreign courts or tribunals, or non-performance of third parties.